The question of food preservatives is a difficult one. One the one hand, heavily processed foods should be generally avoided for various nutrition reasons. They are commonly high in salt, sugar and fat and low in fibre and nutrients. A piece of fruit is almost always more nutrient rich and filling than a fruit bar or a bit of fruit leather. The problem though is that this is often misinterpreted as the fact that all home-made food is better, with parents patting themselves on the back for feeding their children only home-made food even when that home-made food consists of daily servings of biscuits, cakes and ice cream. Others buy into the preservative free/natural colours and flavourings marketing of companies such as the Natural Confectionary Company and somehow believe that these lollies and soft drinks are 'better for you'. Still others, believing that preservatives are actively harmful even in small doses will prevent their child from eating anything processed, even at a birthday party, potentially introducing a raft of food issues down the line. The reality is the majority of preservatives are perfectly safe even at high doses. 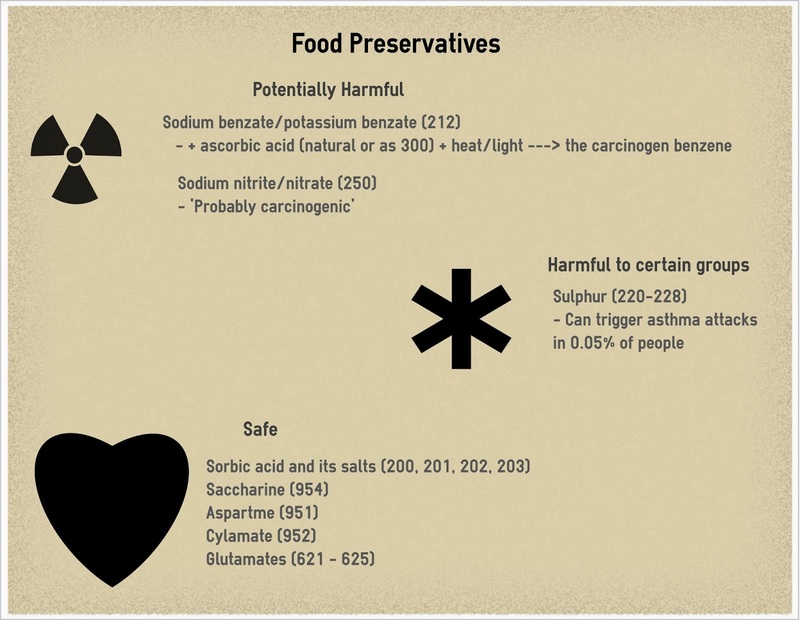 In fact some suggest that these food preservatives may be beneficial by protecting against the effect of reactive oxygen species associated with cancer, cardiovascular disease and ageing 1. Most preservatives have some anecdotal reports of intolerances but the majority of these are at levels too low to be able to provide even an assessment of true incidence rates 2. These intolerances generally appear like an allergic reaction or hives. Even in the case of sulphites which has the highest incidence of true sensitivities the rate is very low at 0.05% and the majority of those affected asthmatic female adults 3. In a small number of preservatives, there is a potential for harm in that they are potential cancer causing agents but these are rare and even in these cases the impact is small. Sodium benzate or potassium benzate can potentially lead to the formation of cancer causing benzene when combined with ascorbic acid (vitamin C). The level produced can increase in combination with heat or light such as may occur during transport or storage so levels will vary. Testing of 98 flavoured drinks found that the majority of flavoured drinks contained benzene levels considered safe for drinking water 4. Potential exposure of benzene from food is small in comparision to intake from air pollution and cigarette smoke. The largest potential sources of benzene are soft drinks, cordials and orange juice and children who drink high levels of these may exceed their recommended daily intake. These are drinks that children (and adults) should not be consuming regularly anyway due to the high levels of sugar and the effects on their teeth. However it is worth noting is the fact that soft drink manufacturers are now taking steps to reduce the levels of benzene in their drinks 6. This is considered to be probably carcinogenic to human due to the fact that it converts into the stomach to nitrosamines. Nitrosamines increase the risk of gastric cancer by a small amount. For this reason it is suggested that intake be moderated 4 . Sodium nitrite is found primarily in processed meats such as salami, ham, sausages and bacon. These are also generally high in fat and salt and their consumption should be limited for these reasons. Alongside these effects there is some suggestion that preservative intake may play a small role in altering the metabolic state of an individual which then affects diseases occurrence. In this case preservatives would play a small contributing factor alongside a large variety of other factors. Larger contributing factors including diet, lifestyle, physical activity and medication 5. The effects of even the preservatives linked to carcinogenic effects are really quite small when you consider all the other known cancer causing factors that are ignored. The greatest health risk is obesity alongside limited physical activity and inadequate fruit and vegetable intake. A child who has any of these risk factors should be having these addressed before worrying about the effect of a preservative while a child without these risk factors is significantly safer than the majority of the population.